The other day my low beams took a hike, both at the same time. Not the fuses, not the bulbs, not the grounds, not the low beam relay. Power out of the relay but no power at the low beam connector at the lamp. 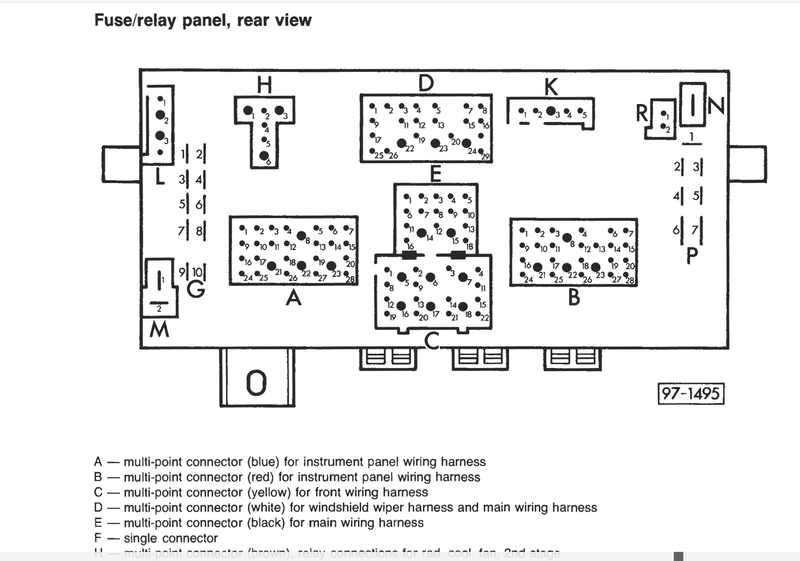 So out of the low beam relay on terminal 87, the current then continues on and back into the fuse panel, pin 21 in the A connector block. See A21? Turned out this connection was the culprit. Was burned and melted. So much so that I couldn’t get the terminal out of the block to replace. What happened to cause this? I’m thinking it’s was one of those positive feedback things starting with a slightly iffy connection, a little resistance making heat which causes more resistance then more heat etc etc. Ending finally in no continuity. Could I have been over loading the connection with 80W lowbeams? The combined current draw for two 80w lamps would be around 12 amps ( at 13.5 bolts) so I’m not really convinced the terminal couldn’t take that. Edit: sounds like I’m trying to convince myself doesn’t it? 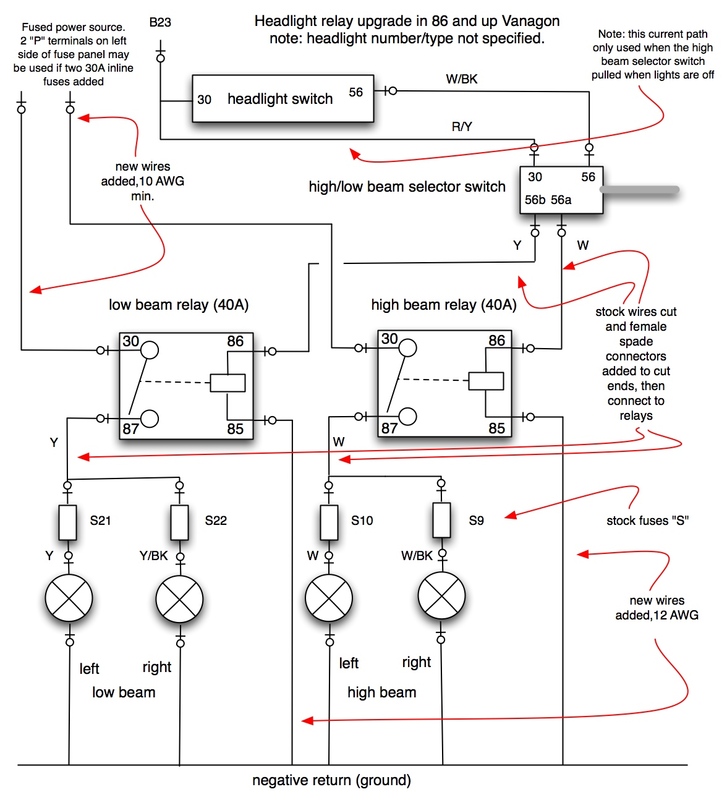 Maybe it is too much current for the pin, however the pin carrying the high beam current shows no damage at all, albeit the high beams would be in use less than the low beams. This might all be moot as I have a lower current draw lighting solution that I hope will pan out. As I couldn’t get the terminal out of the plastic block I cut the wire ( that wire runs directly to the low beam relay) and used the really handy M terminal right close by. 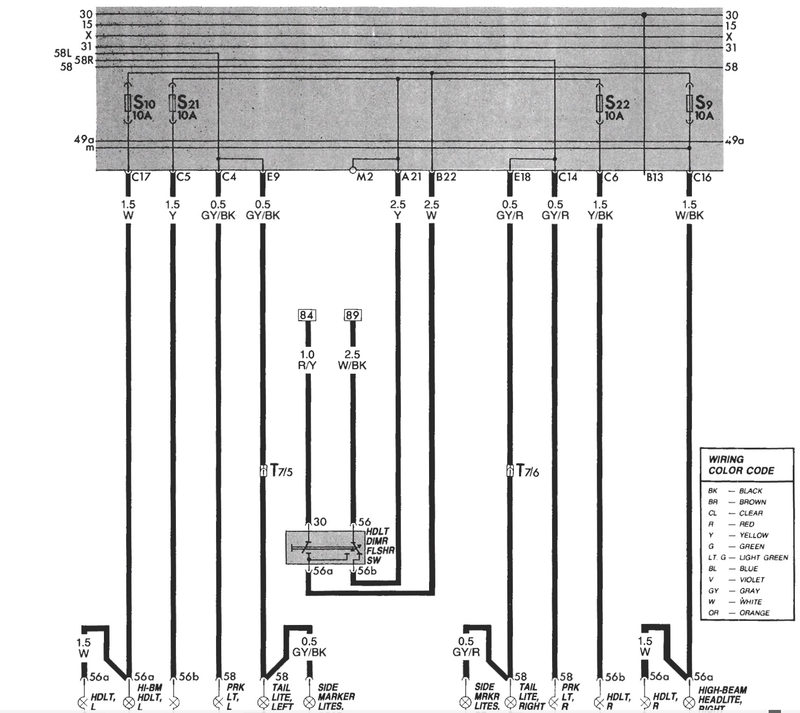 The M2 terminal is common to A21, you can see that on the stock wiring diagram above. Hers the nasty connector ( I tore the plastic clip of the near side) and you see the yellow “jumper wire” to the M2 terminal. It has a bit of black heat shrink on it to give the wire a bit of stiffness, strain relief of a fashion, for the spade terminal. I really hate working on the back of the fuse panel. And getting the plastic terminal blocks out is a bear. And I always seem to knock some other connection loose with all the tugging and twisting involved in getting the connectors out. This entry was posted on December 3, 2016, 4:59 pm and is filed under vanagon, vanagon mods. You can follow any responses to this entry through RSS 2.0. You can skip to the end and leave a response. Pinging is currently not allowed. 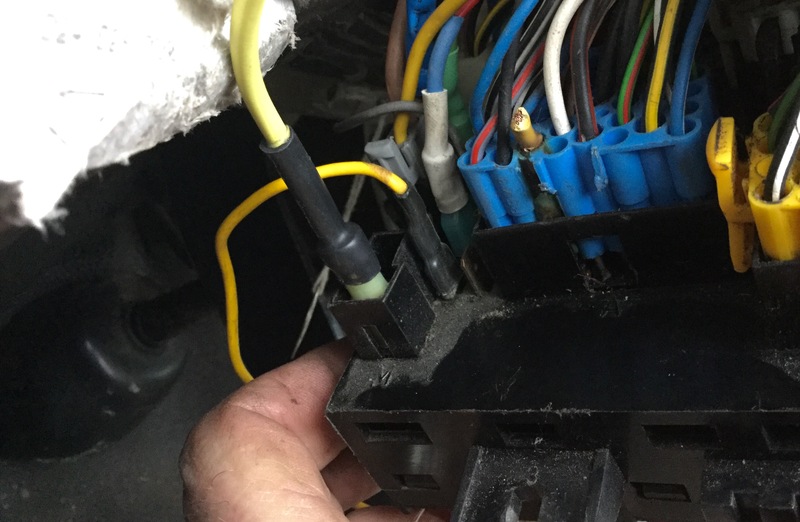 Fuse panel Has been my issue too , my 84 westie has a couple ” bridged out ” circuits blower relay actually has done same thing you just described. I had an ’82 Westy, diesel (I converted to gasoline), and I didn’t like the old style fuse panel it had. Not at all, and I quite like the post 85 fuse panel. Except for one thing, it’s a wrestling match to get good access to the back side. The blower motor issue, I have an experiment going that you might be interested in. I’ll try to get a blog post on it. Another small panel runs off main and everything is relay protected . I could go either way about the amount of current (approx 12A at 13.5V) going through that connection being too much. I think if the connection is really good it’s not a problem, but if the connection has a little bit of resistance then it’s a big problem. In my situation I’m not fretting about it. I’ve plans for a lower current draw (50W lights) solution, that will happen this month. But this discussion might be useful for others. Did you find out why your heater blower was pulling excessive current? I’m playing around with a PWM motor controller just for fun, seeing how well it powers the heater fan.